I was inspired to write this book as a way to go deeper into my own process of healing. There was a creative expression component that was lacking in order for me to truly have my story and my self-growth be flowed in a forward-moving direction. This book in the end has come to me to be a bit of a symbol for having a tangible hand in my own self-creation and self-renewal. I was diagnosed with borderline personality disorder half-way through writing these poems and I had already been knowingly dealing with depression, anxiety, and ptsd symptoms for years before that. So these poems very much represent the crux of what I was and am still trying to mend and not only mend, but accept and make something beautiful out of. I can only hope that my words will have a slight hand in inspiring and moving others who have similar emotional challenges as well. I think sometimes when we are in the darkest of darkness, we can surprisingly see the light from a different vantage point, and that can be poignant and freeing and rewarding and I hope Tourmaline can stand for that. 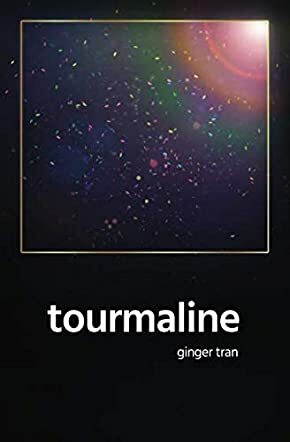 Tourmaline by Ginger Tran is a collection of intimate poems that evoke the journey through change and transformation experienced in the soul of the author, that reflect the nuances and the subtleties of our existence. Diagnosed with borderline personality disorder, the author embraces this reality and uses it to explore the psychological implications of the human experience. The words in each poem come from a secret, sacred place where the author defines their humanity, a questing mind that grabs at the intangible sensations, the movements of the heart, the perceptions of the soul, and the threads that hold their life together and bind them with humanity. The poems explore a variety of themes, most of them with psychological hints — thought processes, personal growth, awareness, reality versus appearances, meaning, art, being human, and many more. There is a unique beauty in the language; its simplicity is deceptive, masking the depth in thought and meaning. Words are so carefully chosen that they take on a life of their own, contributing to the rhythm and the symbolic character of the poems. One of my favorite poems in this collection is the “self-psychology” which invites the reader to develop a strong sense of awareness of the inner processes associated with the changes taking place within us: “keep reminding yourself/ that it is the unburdening / of your damaged psyche / that now needs to find / its own way / of perceiving reality…” Ginger Tran is a poet of the psyche, endowed with an innate ability to capture details of the human heart. The poems are short, each featuring a thought, a movement, an idea, and it’s in their brevity that they become even more enticing and provocative. Tourmaline is indeed a poetic gem for readers looking for poems that are intellectually exciting and heartwarming. Tourmaline is a collection of interesting and inspirational poetry penned by author and poet Ginger Tran. Written in a deeply personal style which reflects the author’s own journey through life, this heartbreakingly raw collection deals with issues such as resilience against difficulty in life, broken personalities, realigning with the self, and surviving and transforming despite the darkness and trauma out there in the world. Ginger discovers, even during the writing process, that she suffers on the borderline of personality disorder, and that struggle to express conflicting emotions and make peace with the sides of oneself is very clear in the writing style. The poems are written in a direct style that asks readers and the self important questions throughout. Far from the ethereal, metaphor-laden work of poets past, Ginger Tran spins beautifully simple words into important phrases which ask the major questions of life of her readership. As she explores her own personal journey of trauma, recovery and emotional management, we as readers are privileged to step inside the swirl of emotions and see just how that inspiring management of feelings is achieved. I particularly enjoyed ‘self psychology’ as one such deceptively simple work, offering a mantra for how to approach and rearrange what you know to be reality in order to make peace with the damage which life has dealt you. All of the verses are easy to access but also bear the need to be revisited time and again. Overall, Tourmaline comes highly recommended for both its poetic prowess and its self-help potential. Tourmaline by Ginger Tran is a book of poems that deals with healing and soul searching. Ginger Tran was diagnosed with borderline personality disorder and this is the way her mind was thinking and healing in the process. It's a very thought provoking book that might have triggers if you are dealing with depression and/or anxiety issues. Ginger Tran has many different types of poetry here and some discuss the universe as well as God. There are a few explicit words too. I thought that Tourmaline by Ginger Tran was a fascinating read. I was intrigued by her views of the universe, as they sound like mine. My two favorite poems were Vortex and Voltage; it was finally nice to find someone who thinks the way I do about the universe. I deal with generalized anxiety disorder and clinical depression, and found this book to be relaxing and thought provoking. The rhythm and cadence that Ginger Tran used was spot on. In fact, I was disappointed when it was over. I kept wanting to read more. I would be curious to find out how someone who never dealt with anxiety issues would see this book. But to me, it was so nice to find someone who understands. I am curious as to how Ginger Tran came up with the title. I thought it was an intriguing word. If you like poetry that deals with the soul and soul searching or if you like poetry that just relaxes you and makes you think, then I would definitely recommend Tourmaline by Ginger Tran. It is a book that you can finish in one evening and gives you a lot to think about.